Hi, I am going to put an additional consumer box in a new kitchen extension. This will require 12.5 meters of cable, from the main consumer box. A French electrical book suggests one can tack on to the end of the run of MCBS in the main consumer box. It would work but I am not convinced this is the best way to do it , and would not be done like this in the UK. A bit in a hurry right now, so a quick answer with several links. Model I: standard approach. Only one RCD, serving also the coupure d'urgence function if this tableau supplémentaire is not inside the main building. Model II: if the second consumer unit has more than one RCD and/or is not inside the main building (main breaker not easily accessible), you'll need a so called interrupteur d'urgence (also: interrupteur sectionneur}. Model III: three more or less separate / autonomous consumer units, incoming supply from one main breaker, the disjoncteur de branchement. 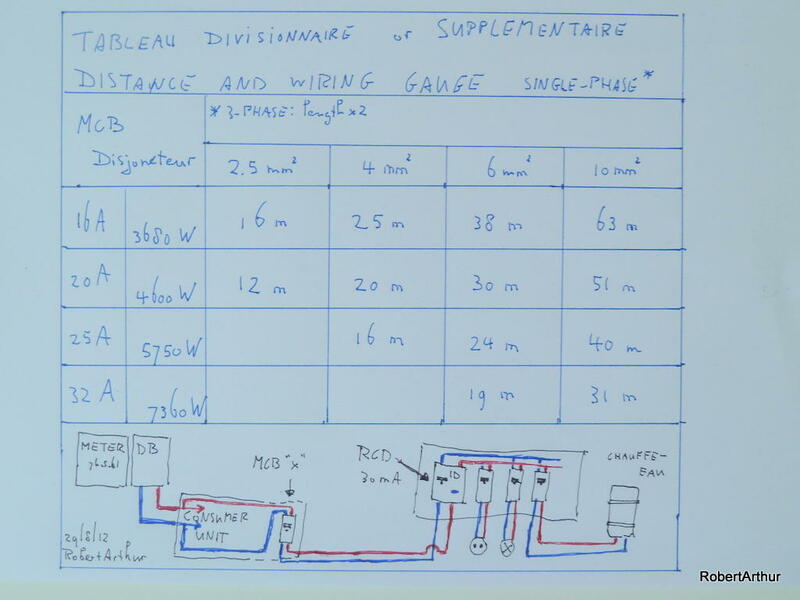 All cable sizes from the main breaker should respect the maximum current of your DB, the courant assigné. For these currents use a répartiteur, in a coffret de répartition. A simple mouse click is enough to calculate the minimum cable size. Thanks for swift reply and the great info. It looks like I wil need a repartiteur and coffret. I cannot find these in Leroy Merlin's catalogue. Are there other specialsts suppliers you can recommend. By the way: any decent coffret électrique or boîte will do, as long as you can fix this répartiteur inside. Just look for the right format and size. Coffret de répartition indicates the function of this box, probably not easy to find this hardware when using this phrase in a google search. About the cable sizes to feed such an additional consumer box. I tried to summarize it in this hand drawn - sorry for being old fashioned - table. It is for single-phase, and for the type 1 connection. Meter and consumer unit close to each other, inside the house. Voltage drop of 2% between the tableau principale and the second one, the tableau divisionnaire. Where meter and consumer unit are not "accolé", the type 2connection, you'll have to halve the distance (voltage drop of 1%) as explained by Promotelec in their latest 26th edition of "Locaux d'habitation". As a rule of thumb IMHO. The maximum voltage drop allowed between your compteur/disjoncteur de branchement and any point d'eclairage in your house is 3%. So it will depend on several factors in this type 2 connection. Custom solutions possible: taking into account actual voltage drop under full load between meter and consumer unit and cable lengths inside the house.